The modern human animal spends upwards of 11 hours out of every 24 in a state of constant consumption. Not eating, but gorging on information ceaselessly spewed from the screens and speakers we hold dear. Just as we have grown morbidly obese on sugar, fat, and flour--so, too, have we become gluttons for texts, instant messages, emails, RSS feeds, downloads, videos, status updates, and tweets. We're all battling a storm of distractions, buffeted with notifications and tempted by tasty tidbits of information. And just as too much junk food can lead to obesity, too much junk information can lead to cluelessness. 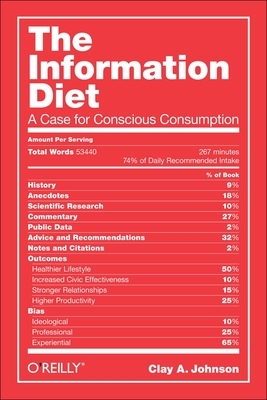 The Information Diet shows you how to thrive in this information glut--what to look for, what to avoid, and how to be selective. In the process, author Clay Johnson explains the role information has played throughout history, and why following his prescribed diet is essential for everyone who strives to be smart, productive, and sane. Clay Johnson is best known as the founder of Blue State Digital, the firm that built and managed Barack Obama's online campaign for the presidency in 2008. After leaving Blue State, Johnson was the director of Sunlight Labs at the Sunlight Foundation, where he built an army of 2000 developers and designers to build open source tools to give people greater access to government data. He was awarded the Google/O'Reilly Open Source Organizer of the year in 2009, was one of Federal Computer Week's Fed 100 in 2010.The range of Johnson's experience with software development, politics, entrepreneurism, and working with non-profits gives him a unique perspective on media and culture. His life is dedicated to giving people greater access to the truth about what's going on in their communities, their cities, and their governments.